I downloaded this from Amazon for my World Book Night reading challenge for the bargain price of 89p! At the time of writing this post it's 59p! Grab yourself a bargain my book friends.The four short stories included in this quick read are Never Stop on the Motorway, The Queen's Birthday Telegram, Stuck On You and Don't Drink the Water and from the first few pages I was gripped and really enjoyed all four.However, my favourite two were Never Stop on the Motorway and Don't Drink the Water as these both created a huge amount of tension in such a short space of time that continued beginning to end. I guessed what was happening in Don't Stop and it felt very familiar. I know I haven't read this story before so maybe something similar has been used in TV or film somewhere (read and let me know if you think the same) bu that didn't stop the sweaty palm situation as I was reading!They are very different stories with very different themes but what they do have in common is that they're all well paced and all have a really good twist at the end. I would definitely recommend and would like to read more from Jeffrey Archer. Four short stories all with a nice little sting in the tale!Writing short stories is a particular art and not one that all novelists can get to grips with; but Jeffrey Archer manages it particularly well. The art of the short story lies in keeping it short, obviously, but still keeping the reader informed and expectant all at the same time. Archer is, first and foremost, a storyteller and it's that ability that's at the forefront here. None of these stores is predictable and they all hold your attention with clever little twists and turns It's an easy read and one that can easily be achieved at a single sitting for the avid reader - so not a book for holidays or long journeys but a good one to curl up with by the fire, knowing you can make a good dent in it before calling it a night.I enjoyed it so much it's my chosen book for this year's World Book Night. A small collection of short stories collected from other short stories book from Jeffrey Archer. I gave it 4/5 star because I had already read three of the stories. Four short stories make up the contents of this quickread book that the Preschool Parents Bookclub will be reading from May 23rd 2014. Will review after our book club meeting on June 20th. I loved this book. The short stories were really well written and a brilliant picture painted in such few pages. I particularly enjoyed 'Never stop on the motorway' and 'Don't drink the water'. I really raced through these stories wanting to eagerly get to the conclusion. I will definitely add Archer to my authors to read list following this intro. I wasn't sure I enjoyed Archer's writing style when I started, it seemed a little clunky, but the pace of the first story soon sped up and I forgot all about it. I liked these stories; although I was expecting something a little more "thriller". I'm not sure if I'll read anything by Archer again, but I liked the premise of these. Firstly, the book itself. This is a Quick Reads book, of four individual short stories. 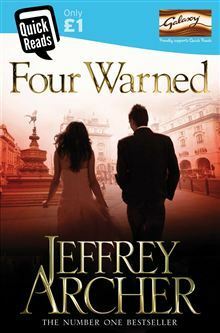 In the first, Diana is being followed by a black van.In the second, Albert celebrates his hundredth birthday.The third sees Jeremy steal the perfect engagement ring for his affianced.And the fourth story is from a book the author famously wrote whilst serving time in prison, and is written as a story told to him by a fellow inmate.Personally, I found three of the stories to be highly predictable, and one was most unsatisfactory to my tastes.The writing itself is good, it's just that I wasn't too keen on the plots. So don't let me put you off, it just wasn't to my taste. I have to say I thoroughly enjoyed these short storiesNever Stop on a Motorway - was an exciting thriller which had me on the edge of my seat. It is a story I will remember for a long time The Queen's Birthday Telegram - the weaker of the four stories to be honest this story didn't make a lot of sense and was poor compared to the others.Stuck on You - is a cleaver tale that leaves you guessing until the end with a nice twist Don't drink the water - Is a brilliant story which makes you both laugh and be amazed at the twist in the endOverall a quick read that is worth picking up. This is a very small book of 4 short stories. I'm not sure if I should include it in my Goodreads list, but it was a WBN book. It was a big disappointment for a WBN book, in fact it could almost be classed as a publicity stunt (not really what WBN is all about!). The stories are ok but nothing special. Not a 'book' I would recommend. 2016 - I remember reading at least the first story before ... but it's not been marked down here, which is strange.2016 - couldn't remember the other three stories so maybe I didn't read the whole book or I read the first story elsewhere!! Anyway it was a lovely collection of 4 short stories. Varied. A fabulous collection of 4 very thrilling short stories that make for an easy lazy afternoon read, simple language but really gripping plots and storylines in each of them, highly recommended to anyone ! A great little set of four stories. The first was gripping and a bit scary, the second was sweet and funny, the third was my least favourite but intriguing, and the fourth had a surprising ending. I was given this book as part of The World Book Night promotion and I'm glad to have received it. Three of the 4 stories are good (I thought the Queens Birthday Telegram the weakest) - as long as you haven't read them before! Far from being a new collection of short stories as I expected, this is simply a rehash of stories featured in previous collections from 2004, 2007 and 2010. Good bedtime readAlways a twist at the end with Jeffrey Archer. Informative about St Petersburg tourist attractions if one is thinking of visiting. A small cosy, nice quick read. A good taster of a much maligned author! I didn’t find any of these short stories gripping or that original. The Queen's Birthday story was so poor. I was waiting for a big twist and nothing happened!